Cartridge Gauge – make sure you buy a cartridge of the same gauge as your shotgun. 12g cartridges come in all colours, where as 20g tend to be yellow. Gauge is an old measure of barrels which has stuck for shotguns. 12g means 12 lead balls of equal diameter to the barrel would equal one pound in weight. Therefore, the larger the number, the smaller the cartridge diameter. 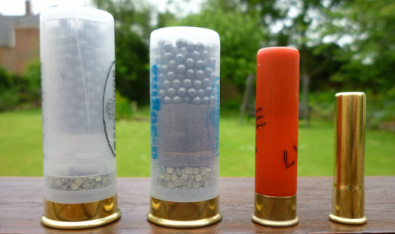 Cartridge Length – some game cartridges are 2.5” (65mm) to fit older guns, but most game and clay cartridges are 2 3/4” (70mm) which helps them to cycle better in semi-autos. 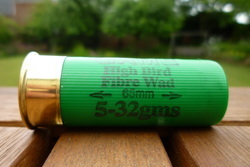 3” (76mm) is mainly reserved for magnum loads and high performance wildfowl cartridges. Remember, it isn’t safe to shoot a cartridge longer than your gun's chamber. Also the length refers to the cartridge after it has been fired so don't go measuring unfired cartridges! Wad type – these will be fibre or plastic. The wad is like a "plunger" between the propellent and the shot. Fibre wads are preferred and often compulsory outside of clay grounds as they biodegrade and won't harm livestock if eaten. Plastic wads hold better patterns as they hold the shot like a cup but shouldn’t be used without permission. It is worth noting that nearly all steel shot cartridges use plastic wads to prevent barrel wear although Gamebore makes a biodegradable shot cup for shooting steel over farmland. Shot Size – The larger the shot number, the smaller the shot. As a general rule, if you are using steel shot on live quarry, move down a shot size or two. The above is only a guide, and will depend on the range over which you want to shoot. If in doubt use a larger shot, but bear in mind that very large shot can cause excess damage to meat and will have less pellets in the pattern. Furthermore, 32g of 4 shot will contain a lot less pellets than 32g of 6 shot. Load weight – this is measure in grams and refers to the weight of shot in the cartridge. A typical clay load will be 21-28g. A typical game cartridge will be loaded with 30-32g of shot, and a normal wildfowl cartridge up to 36g. In certain cases shooters are legally obliged to use non-toxic cartridges for shooting. This is primarily when shooting wild-fowl and over wetlands, the foreshore and SSSI. The law is not consistent across Scotland and England and Wales so if you are unsure check the BASC website for clear guidance. Steel (iron) is the most commonly used metal for non-toxic shot cartridges for the simple reason that it is cheap. Steel is less dense than lead, so larger shot sizes are used to help retain energy at distance. The major downside of steel is that it is much harder and lead and as such can cause damage to some gun barrels. It is also almost invariably sold in plastic wads which is a consideration on some shoots. It is important to understand whether a steel cartridge is suitable for use in your gun. Check with your gunsmith whether your gun is suitable for use with steel-shot. Standard performance steel-shot cartridges are designed to work at pressures safe in most guns, provided the cartridge does not exceed the gun’s chamber length. It's advisable not to use a choke that exceeds ½ constriction. You should however check the manufactures recommendations before use. High performance cartridges should only be used in specially proved guns which are made to withstand much higher pressures. 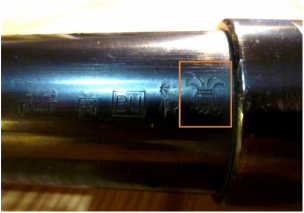 Guns suitable for use with steel-shot cartridges will bear a fluer-de-lis proof mark as shown, and again the cartridge should not exceed the gun’s chamber length, and the choke should not exceed ½ constriction. Bismuth would be a good non-toxic alternative if it wasn’t so expensive. It has a density between lead and steel and is soft enough not to cause damage to gun barrels. Bismuth cartridges also have the advantage of being available with fibre wads, and they may be used through more tightly constricted chokes than steel. I keep a supply for use in my fixed choke Browning. There are other non-toxic loads available such as tungsten matrix (similar properties to lead but seriously expensive). Whatever you choose to use, make sure your cartridge and gun combination is safe, and seek professional advice if you are unsure.